The DCU Faculty of Humanities and Social Sciences (HSS) has had the highest first year undergraduate dropout rate for the past five years The College View can reveal. Some 6.66 per cent of first year HSS students withdrew from their course of study over the past four years. This is closely followed by 6.29 per cent of Science and Health first year undergraduates. In 2012, 8.68 per cent of first year HSS students withdrew from DCU, the highest figure in any faculty in any of the five academic years in the time period 2011/12-2015/16. 49 of the 564 first year HSS undergrads withdrew from DCU that year. Conversely, the School of Business (BS) has seen the fewest number of first year dropouts at 4.28 per cent over the past four years. The Engineering and Computing faculty has seen a drop out of 4.76 per cent of first year students in the same period. A subset of figures exists for courses that stretch over the DCUBS/HSS faculties, namely the Economics, Politics and Law degree. The drop-out rate in this bracket for first year undergraduates was 7.25 per cent in the same time period. These figures are from the academic years 2011/12-2014/15. While figures from the current year are available, they only cover withdrawals until January 31 of this year and so have not been considered in this comparison. The figures from this year so far when combined with the previous four years convey that at the time of their release, HSS first year undergraduate dropouts remain the highest. These figures do not account for students who have deferred their course or who have transferred internally in DCU to another course. While a request for drop-out figures from the subsequent years of study following first year were made, this information was not returned. However, withdrawals in first year account for the majority of withdrawals made. Looking at the time period from the academic years 2006/07-2015/16, 2014/15 had the most student withdrawals across all years. 310 students withdrew from DCU that year, 208 of which were undergraduates, 69 were postgraduate taught, six were postgraduate research and 27 were non-award. 166 students have withdrawn from DCU so far this academic year, the lowest recorded number following that since 2006 was in 2011/12 when 178 students dropped out. Based on the figures obtained by this paper via a Freedom of Information request undergraduate drop-out rates across all years of study remain small. 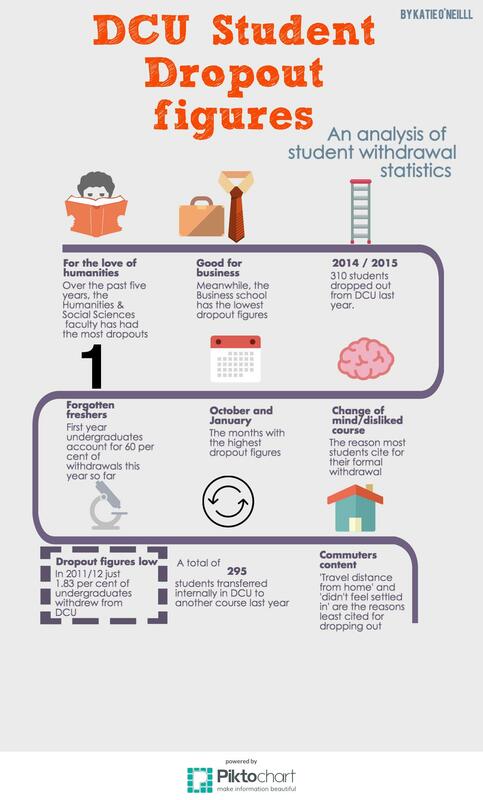 In 2011/12 just 1.83 per cent of undergraduates withdrew from DCU. The highest percentage in the last five years was in 2012/13 when 2.69 per cent of students withdrew. Upon leaving DCU, students dropping out are required to complete a ‘R27 – Notification of Withdrawal from DCU’ form. The form allows outgoing students to express their reasoning for withdrawal. Motives range from disliking the course, accommodation issues, financial reasons and health reasons. The most common reason cited for withdrawal since 2010/11 is ‘change of mind’ followed by ‘disliked course’. Two options, ‘didn’t feel settled in’ and ‘travel distance from home’ were the least cited reasons for withdrawal excluding ‘examination appeal’ which just one student said was their reason in 2012/13 and ‘suspended-disciplinary’ which one student said was their reason for withdrawal in 2010/11. October and January are the months in which first year undergraduates have tended to withdrawal over the past five years. Taking into account the growing student population figures, the academic year 2011/12 saw the greatest number of internal transfers over the past five years. A total of 5.63 per cent of DCU students transferred internally into another DCU course in that year. Deferral numbers have remained consistently low. The academic year 2014/15 saw 0.97 per cent of students defer their upcoming academic year the highest figure in the past five years.